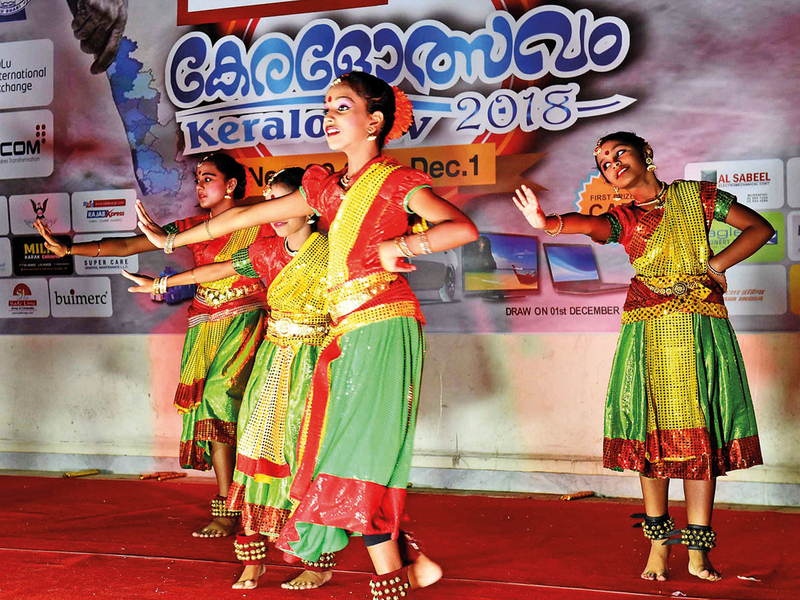 Abu Dhabi: Expatriates from the South Indian state of Kerala and their friends are enjoying the state’s culture and heritage at a three-day event in the capital. Kerala Festival at the Kerala Social Centre (KSC) is offering cultural and musical performances, traditional Kerala cuisine, street foods and books. The event which kicked off on Thursday evening will end on Saturday night. “This is a colourful occasion to enjoy a long weekend,” said M. Rajmurugan, counsellor of consular affairs at the Indian Embassy in Abu Dhabi, while inaugurating the festival in the presence of prominent Indian business and community leaders. Themed ‘Building a new Kerala’, part of the festival’s proceeds will be utilised for the reconstruction of Kerala, said A.K. Beeran Kutty, president of the KSC, a 46-year-old sociocultural organisation in Abu Dhabi. The festival will also help complete the renovation of the KSC building, he said at the inaugural ceremony on Thursday. Bijith Kumar, general secretary of the KSC, said the festival would be remembered as the most popular event in the history of the centre. A draw will be held on Saturday evening, which will give away a 2019-model Nissan Sunny car as the first prize and 100 other prizes. A tiny doll made out of handloom saris damaged in Kerala floods is a major attraction at the festival. Chekkutty [the tiny doll] has already attracted wide attention, the embassy official said. “This is an innovative idea to support the traditional weavers in Chennamangalam [near Paravoor in Ernakulam district of Kerala, which is famous for its handloom products],” said Rajmurugan. He visited the stall selling the dolls and interacted with the volunteers of the Friends of Kerala Shastra Sahitya Parishad (FKSSP), a community group that conducts live sessions of doll making at the festival. He was referring to the political controversy and violent incidents in the state sparked by the historic Supreme Court verdict in late September allowing women between the age of 10 and 50 to pray at Sabarimala, a famous temple. The issue has diverted the efforts to rebuild the state’s infrastructure and facilities ravaged by the floods in August. Thaikkad said they purchased damaged saris from the weavers’ society in Chendamangalam. “They already got paid when we bought the saris. Now the proceeds of the doll-making project will be donated to the Kerala Chief Minister’s Disaster Relief Fund (CMDRF). However, such a donation is not the aim in itself. The doll is a symbol and tool to remind Keralites that by doing small things they can be part of rebuilding Kerala, a cause they almost forgot due to other political issues,” he explained. The group made scores of dolls in community workshops of residents, including women and children in Abu Dhabi. 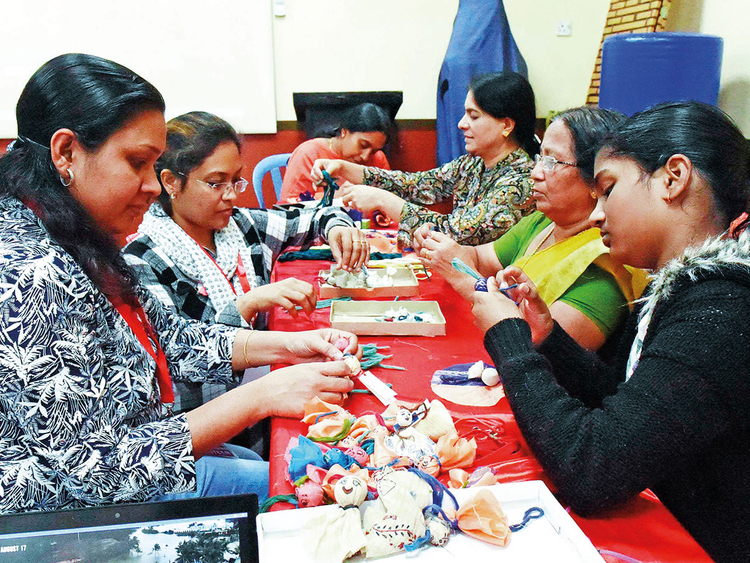 Smitha Dhanesh, president of FKSSP in Abu Dhabi, said a group of children of determination from Sharjah is also joining the doll-making camp at the festival. Meanwhile two prominent Kerala social entrepreneurs, Gopinath Parayil and Lekshmi Menon, who mooted the idea of Chekkutty, will address the visitors at 4pm on Saturday. They will also lead a workshop afterwards. Eid Kamal, a volunteer, said the doll-making project would encourage an estimated one million Keralites in the UAE to be part of Kerala’s rebuilding. Thaikkad said the FKSSP aims for ‘one chekkutty doll at every home in the UAE’ and will organise community workshops across the seven emirates to accomplish it.